This 10x8 shed is one of our top selling outdoor storage sheds thanks to its 6’ tall side walls and extra wide 64” double doors. These coveted features make it easy to store long handled tools, gardening equipment, lawn mowers, tractors and bicycles inside. The exterior is protected by an engineered wood siding that is completely resistant to rot, decay and insects. 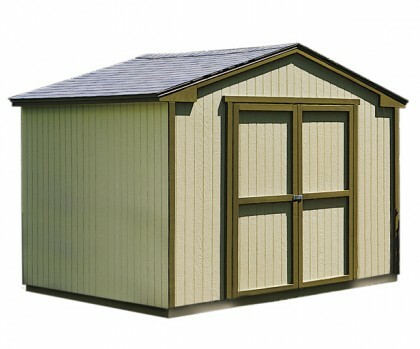 This strong and durable 10x8 shed will simplify your everyday life and stand out in any backyard landscape. To maximize your available floor space, customize your storage shed's interior with a shelf and workbench. Consider adding a window to make your shed feel like home too. 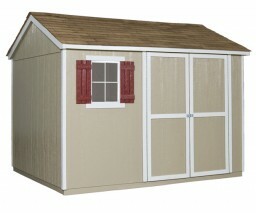 Be sure to check out our wide array of accessories to make your outdoor storage shed complete. Your local building authority may have specific requirements resulting in additional cost. Prices do not include painting, staining, permits, zoning and setback advice and/or compliance, excavation, or leveling beyond 6". All prices and content are subject to change without notice. Promotions are valid with online transactions only and cannot be used in conjunction with promotions at a servicing sales/distribution center or distribution center. Not valid on prior purchases. All stated sizes are nominal dimensions and approximate. Some buildings may be shown with optional items. Additional mileage charges (if applicable) and taxes will be calculated after checkout process is completed. Painted 10x8 shed is a representation only, arrives primed for painting in a light beige color. I love my shed! It's used at my barn for tack. It has done great through some pretty bad weather. I painted mine inside and out. My only peeve is that the vents were not really in a good spot. its a great shed for my husband to do his projects, it has alot of space for him, it was made very strong. glad i purchase this shed for him. The shed is just ok but the person installing it was not. He was rude and made a bunch of holes when drilling, then told me I would have to fix them. He said people can't expect them to be perfect. Well I disagree with that, I shouldn't have to fix anything new plus he did the damage not me. The company did make him come back out and fill the holes with caulking which now I have to maintain. The shed is just what I wanted and the quality matches up well with the price. The local installer, however, cancelled the installation twice and to make matters worse I only found out they were not coming when I called on the scheduled day to find out why they hadn't arrived yet. I was then given some obviously contrived excuse as to why they weren't coming. I understand that things don't always work out as planned and that schedules sometimes have to be changed but in both instances when they cancelled it was clear that they knew in advance that they would have to make a change but then didn't bother to let me know. So, not only was I lied to about why they weren't coming on the scheduled day but I lost time from work for no reason. The shed was a great purchase. The price and the installation was great. The installers were professional and so was the quality of the product. The shed is great. We've had it for 1-1/2 years and have no complaints. The guy showed up with all the materials and built it in place all within a day, and the workmanship is great.